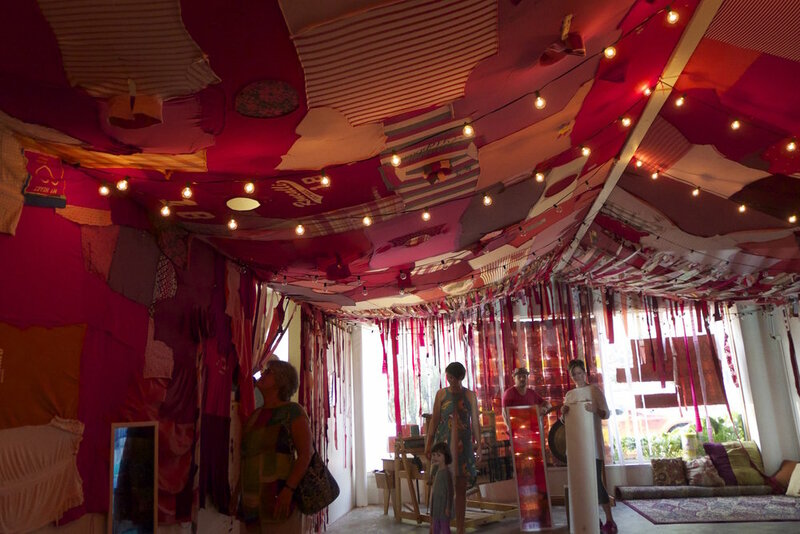 Woven, a collaborative project by Camille Hawbaker and Victoria Hoyt, was a reverse iteration of UNL Womanhouse’s 2011 exhibition, The House That Feminism Built, in which community members were invited to sew a house out of used, red-hued clothing that doubled as a gathering space for performances, discussions, and meetings. Woven used the transformation of that structure as a point of departure to enact contemporary modes of feminist art practice and theory. 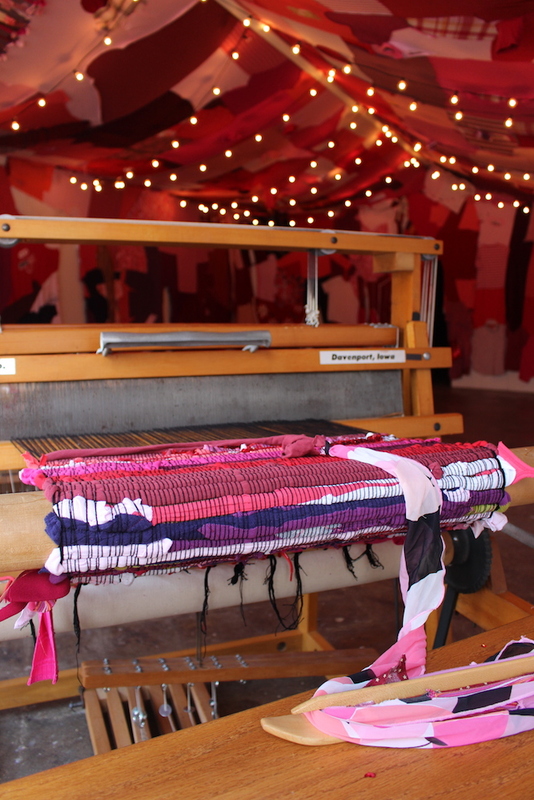 The House That Feminism Built was woven into a giant rag rug during a series of “Open Floor” events with community performances, food, discussion, and social time open to the public. 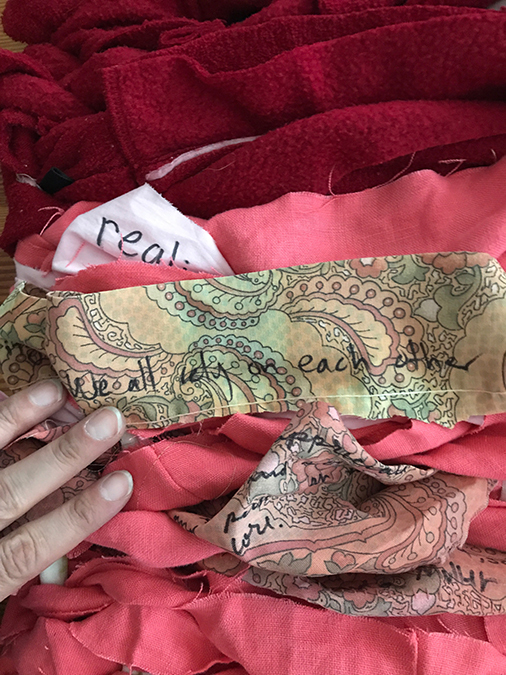 These events included mending/dyeing/craft workshops with a focus on self-care, reusing materials, and slowing down. In addition to inviting audience participation throughout the exhibition, Camille and Victoria sought out individuals engaged in intersectional feminist practices to help curate a robust calendar of discussions, activities, and workshops. Through deconstructing what was built by a largely academic and white group of feminists, the artists examined race, privilege, and power in deeper, more personal ways. Victoria Hoyt is interested in connecting everyday, emotional and fragmentary experiences into wider narratives. She is a bricoleur by nature and thinks abstractions into being through material play. Camille Hawbaker is similarly drawn to the tactile with her practice including printmaking and fiber arts. She works poetically and intuitively with language and line to express what cannot be conveyed by words alone.